It is always a treat to get visitors at my house. It is a million times more wonderful when family comes over. Last weekend my mother, father and grandmother came for a visit! Naturally, I was so excited I immediately planned a meal I would be proud to serve them. I decided to keep the menu simple but interesting. My main was Murgh Mughalai (Murgh=chicken), with basmati rice and naan and rava hulwa. For dessert, homemade French Vanilla Ice Cream made with my own homemade vanilla extract! (recipe to follow). Fun Fun Fun! (and I admit, a little nerve wreaking serving Indian food to my Indian parents when I don’t cook Indian food that often). At any rate, I made the meal and it was met well by my family. Joy! Couldn’t take a fancy food photo but I did manage one shot at least. On to the recipe! Mughalai cooking comes from the imperial kitchens of the Muslim Mughal Empire. This is a North Indian Dish that has strong influences in Persian Cultures. Optional: Pretend you are royalty when you eat this dish. Also Naan and Basmati Rice can’t hurt! Also Soak 16 cashew and 10 almonds in water overnight. 5) Add red onions and cook until it starts to brown. 8) Deglaze pan with chicken stock. 9) Add garam masala, nutmeg, coriander and salt to taste. 10 Bring to a boil and then set to simmer. 11) Add chicken pieces and cream. 12) Reduce sauce until it is thickened to your liking. 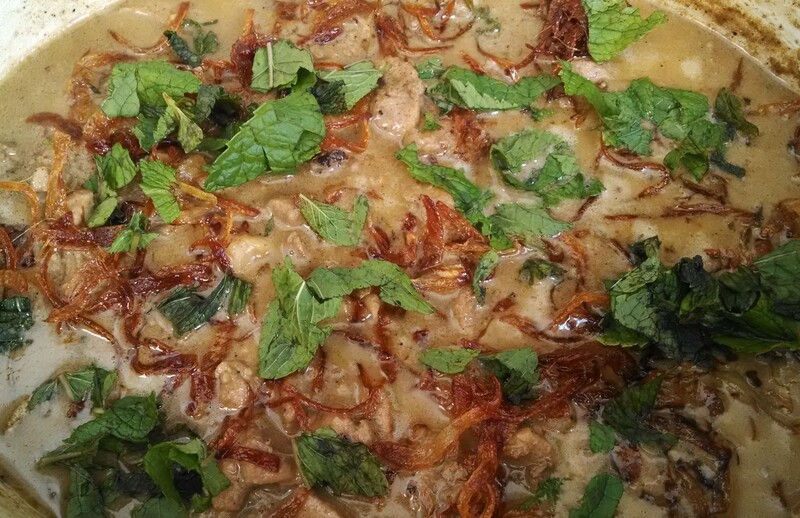 Fried onions and mint to top before serving.